As I mentioned yesterday, I had quite the weekend in Paris. It was my 4th time there and yet it was as exciting as my first grace â my impressively knowledgeable professor and the spring weather. We even saw the stars of the infamous Theatre du Chat Noir! before checking out the Andy Warhol exhibit at the Grande Palais. That night I met up with the lovely Marie and friends près de Bastille. And the next morning, we were up bright and early for the Louvre. We even went down into the original foundations of the castle that had once stood in it's place. My friends got trapped in one of the nooks ;). Lunch was eaten on the outside of a café while people-watching. I enjoyed every last bit of my Quiche Lorraine... yet forgot to photograph it :(. And the rest of the afternoon was spent at le Musée Gustave Moreau. The gallery was situated in the exact studio where he had worked, above the apartment where he'd lived, it was incredible. The night was spent in the Marais district, one of my favorite areas, and apparently Sarah's as well :). We ate dinner at one of many Israeli restaurants there (delish) and then met some of my friends from school that were also in Paris for the weekend with a class, they're currently studying in London. On Sunday, following a visit to the Notre Dame, we were out and about once more for le Musée national Picasso Paris. The building was also holding great temporary exhibitions of Daniel Buren and David Douglas Duncan. Afterwards, I needed sushi ;) so we lunched at a nearby restaurant. The Art Nouveau style of the building was fabulous. ate a scrumptious dinner, and caught our train back to Strasbourg. 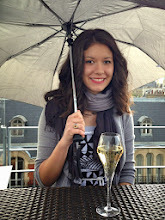 Just so you know, girlies, this Parisian photo medley marks my 200th post. I can hardly believe it myself. I definitely believe that I've grown as a person since my first one as I've been exposed to more things than I could have imagined, met people that I hope to stay in contact with for the rest of my life, and seen places that I cannot wait to go back to. My entire world view and cultural understanding has reached beyond their former limits and I'm happy and proud of the progress I've made while traveling. And so, I would like to thank you for having joined me :) and, of course, for wishing our very special Veggiegirl the happiest of birthdays!